Confession: Mark and I recently passed our 10-year mark as a couple, but since we got married last June, we pretty much skipped over the date. I sent him a sweet little text reminding him what day it was and he responded, but the day was nothing out of the ordinary. We originally tried to plan our wedding so that the date would fall closer to our old anniversary, but we were having an outdoor ceremony and reception, and the weather can still be a little unpredictable in early April, even in sunny Southern California. But nine years is a long time to celebrate one anniversary together and then suddenly switch, right?! So I was wondering, what do most couples do once they get married? 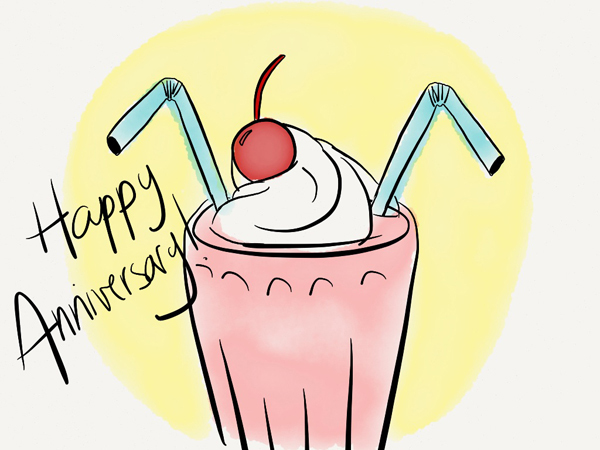 Do you still celebrate your dating anniversary? If you’re not married yet, do you think you’ll still commemorate your first date once you do tie the knot? P.S. Here’s another relationship question for ya: Do you go to bed together? This entry was posted in Relationship Question, Weddings + Relationships and tagged anniversary, mark, married, wedding. Bookmark the permalink. One Response to Relationship Question: Do You Celebrate Your Dating Anniversary?